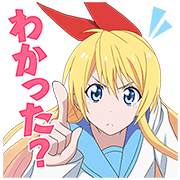 http://www.line-stickers.com/ – Nisekoi Line Sticker | You thought gang warfare was tough? Just wait until you step inside the topsy-turvy love triangle (and sometimes rectangle?) that is Nisekoi. These stickers are 100% infused with laughter and confusion! Previous post Happy Ramadhan Days with LINE!